We’re only six weeks away from the end of the semester! No matter how you dice it, this can be a stressful time of year as Finals are just around the corner and so are the holidays. But wrapping up the semester doesn’t have to be cringe-worthy, there are a few ways to minimize stress and ace your final push through the end of the semester. Much of the stress of Final Exams is trying to figure out how to fit necessary studying and classwork in between family obligations, work schedule, and at this time of the year HOLIDAY events and parties. Telling yourself — “don’t worry, it will all work out”, really doesn’t work most of the time. Create a plan — Yes, a plan and WRITE IT DOWN! If you’re anything like me, I suggest entering your plan into your iOS or Android calendar. Plug in the dates of each courses’ Final, plan out when you will study based on the Final date, work, family obligations, sleep, meals, and breaks. All these things are important and if you strategize your time accordingly. Physically writing it down on a calendar or digitally will not only provide you with a clear path to success, but you’ll be able to share said calendar with close friends and family, so they know your plans as well. There is nothing worse than having a plan but not sticking to it because friends or family pressures come up. There will always be last minute distractions, but if you can plan for 80% of your time the rest can be filled in by those last-minute events. So why write it down? Have you ever looked in the fridge and there was nothing good to eat and then walked to the pantry and there was nothing there either? So, off to the grocery store you go — But what happens when you don’t have a grocery list? First it takes you twice as long to complete your shopping, you spend more money than you initially anticipated and finally, you either forget to get something, fill your fridge and cabinets with junk food or purchase foods that won’t even last you through the week! Planning ahead and having a written plan of action, will help you stay on task and be more efficient! It may seem laborious to actually plan out the next six weeks, but I challenge you to try it and see if it makes a difference. 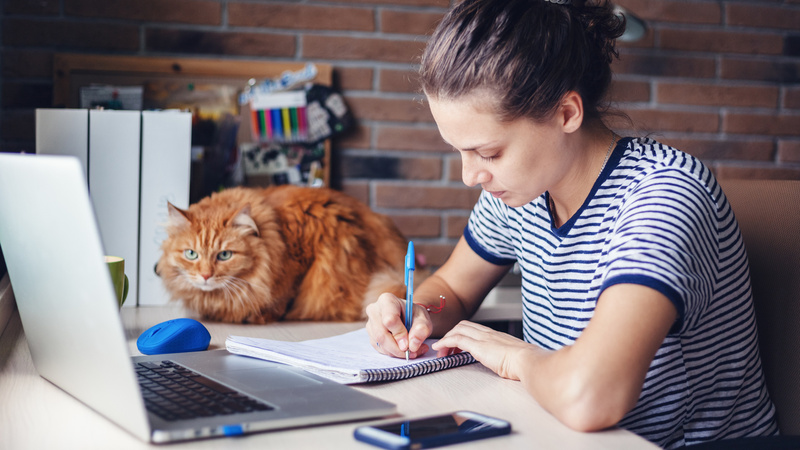 Besides writing out your Final Exam Plan here are a few other helpful hints from Fastweb to help you be more successful. Regardless of whether you’re a full or part-time student, by this point in the semester you are probably tired of taking notes, reading textbooks, looking at code or struggling to organize all the course information collected over the last 7 weeks. Most students start out strong with great dedication to learning. Over the weeks, however, other priorities and distractions tend to take over. Now is the time to rededicate yourself to your studies — Review your notes, re-read the textbook, and ask questions… lots of questions. Leave no question unanswered! One way to rededicate yourself is to join or create a study group. You are not alone in feeling overwhelmed or in need of help. Gather a few others from your class and create a weekly study group to help each other get ready for the final exams. REMEMBER, your instructors will most likely give you a review packet or syllabus that has a list of what the final exam will cover so make sure to take advantage of this resource. Another hint is to ask questions of your instructor. If they haven’t provided details about the final exam yet you need to ask for them. You should be asking — What will be covered? What is the exam format? How many points will the exam count towards your final grade? What study suggestions does your instructor have? What is your current standing in the class? Having answers to these questions will guide you in studying smarter vs. harder! You may also want to check in with your campus tutoring center as they will most likely have additional resources and assistance available for you. Remember, not all classes are created equally, so final exams will be different as well. Studying for a Calculus exam is different than studying for an English or Foundations of Computer Science exam so use your Tutoring Center to help you identify the best study strategies for successful outcomes! You now have a study plan, are part of a study group, have reviewed your notes, completed your final projects, searched the internet for examples, created flash cards, completed all the practice quizzes in the back of your textbooks, but have you remembered to breathe? Yes, we all need a break so don’t feel bad about taking time for yourself. The last thing you need is to burn out on exam day and completely blow it. So take some time for yourself… go to a movie or that epic holiday party… or yoga with friends, whatever you do to decompress and change scenery. Finally stay positive — You got this! You’ve done the best you can to prepare yourself, you have planned and studied and have set yourself up for a good outcome. Get a good night sleep the night before your exams and remember to breathe. Stay positive, relax and let all the work you have completed so far lead you to success. The Minnesota State IT Center of Excellence engages employers, educators, technology professionals and learners to develop a more robust IT workforce in Minnesota. A Center of Excellence within the Colleges and Universities of Minnesota State (formerly MnSCU), it is located at Metropolitan State University, St. Paul Midway campus. For more information, visit the IT Center of Excellence.